Jason - We met on campus because we were both in the music department. We were friends before we became a couple. The big turning point was when we were both playing in the wind symphony. I played the saxophone and Erica was a flutist. But those two instruments don't sit together. One semester, I was asked to play the oboe so we got to sit together and I got to turn on the charm. Erica - One day after rehearsals, I asked if he wanted to go out that night. We went to Shenanigans in town and then we were dancing. Jason - This was completely out of character for both of us! They started dating in late December of 1995. Jason - I took a couple of months off from SIUE after Christmas break because I was invited to join an R&B group who was doing a Department of Defense tour in the Mediterranean. We toured U.S. embassies and troops overseas. I wrote letters back and forth to Erica while I was away. Erica - We started getting more serious when he got back in February. Tell me about your engagement. Erica - There wasn't really a formal engagement. I was trying to finish up school and we had talked about getting married and getting a house. So, it was more of a mutual agreement. We set a date and starting shopping for a house. Jason - We bought the house first and were married in our house. The wedding was on January 15, 2000. We bought an old house, 1925 style home, in Alton, Ill. It had really pretty wood work. We had a nice simple wedding with our music friends who provided the entertainment. Jason and Erica have two daughters - 6 years old and 6 months old. Jason - I am in instructor, primarily jazz. I teach various courses including Music 111 and Jazz History. I also conduct the university's jazz band. I've worked here since 2000. After I graduated with my master's, the University started adding more and more classes as an adjunct. I've been working full-time for five years. Erica - I teach private flute lessons in the Alton area. Jason - That's an easy answer for me because I get to work with them every day. My favorite professors are the jazz guys - Rick Haydon, Reggie Thomas and Brett Stamps. Erica - My favorite memories are of the flute studio that we had at the time. Our professor was Marie Garritson and we were a very active studio. We had a lot of competitions off campus. We have a lot of funny stories from having to get up early in the morning and drive a hundred miles for a competition. What advice would you have for the current and future music students? Jason - First and foremost, they might not realize it while they're here but the connections they make with the faculty and fellow students will be connections they will keep throughout the years. A lot of the work that I get can be traced back to connections I made along the way. Working in the arts, it's all about connections. 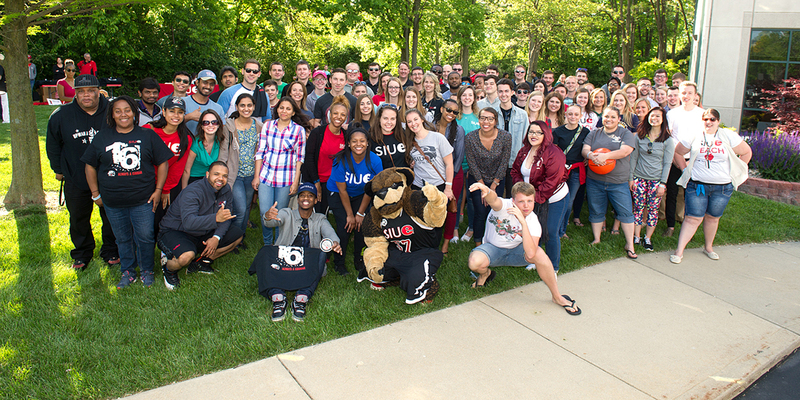 I've definitely made a lot of friends through SIUE. Erica - Even after being away for so many years, I still have close friendships because we have a shared experience. You get the chance to serve on ensembles together, practice and travel together so you become close. When we moved to Alton, we realized that there were faculty and former students living in our neighborhood. Erica - You know, we're not the only couple from the music department who dated and are now married. Jason - We know a lot of fellow classmates who met on campus and are married still. You get the opportunity to meet someone who shares your interested. Erica - You go on band trips so that's just more time spent together. Jason - Only music students would have fond memories of spending many hours on the couches in the basement (of Dunham Hall) and the practice rooms. We were serious while we were in the practice rooms, but then you would take a break and socialize and hang out on the couches. A lot of friendships developed in the hallway. Jason - It's surreal because the very room Erica asked me out in is where I teach every day (the jazz band room). What do you think of the changes that have happened on campus since your graduation? Jason - I haven't left here since finishing my master's so I've seen the changes take place along the way. I think it's a bigger difference if you haven't seen the campus in awhile. But, the quality of students and the quality of the campus have grown tremendously. If my former roommates ever made it back here, they would be amazed at the changes. Erica - There's definitely more of a college atmosphere now than when we were here. SIUE was still mostly a commuter school at the time. Jason - I lived in Tower Lake for a few years. Erica - I commuted from a parents home until I got a job as a nanny in town. I lived with that family until graduation. Jason is from Shattuc, Illinois and Erica is from Alton, Ill.
Why did you pick SIUE? Erica - It was close. Dr. Bell, who is the head band director, was into recruiting at the time and he knew my band director in high school. I was involved in the flute camps on campus and received a scholarship from the University. Jason - Actually, Dr. Bell is indirectly responsible for us dating because he was the one who roped me into playing the oboe that semester. Erica - Jason hasn't mentioned that he is a professional freelance saxophonist yet and he's wonderful! Jason - I had auditioned at several different schools and there were different reasons for picking SIUE. It was the location because I commuted back and forth my first year even though it was a long commute. I wanted to get away from home, but not too far away. And, the cost. My parents were considering the cost. It was a blessing in disguise that I came here, because the jazz faculty are beyond compare.